Plant un-tidy and bushy, growing to an almost shrubby 2m high. Other Deadly Nightshades grow close by, one upper left. Leaves large similar to those of Potato (which is in the same family) under which the much smaller flowers may lurk (centre top). 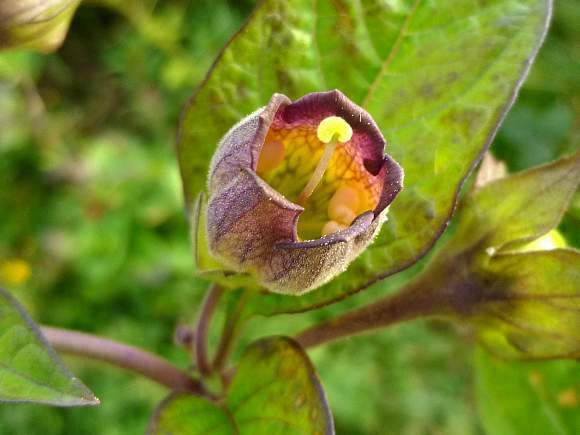 Flowers bell-shaped with 5 out-turned petals, green near the stem graduating to a deep purple or beetroot colour at the tips. 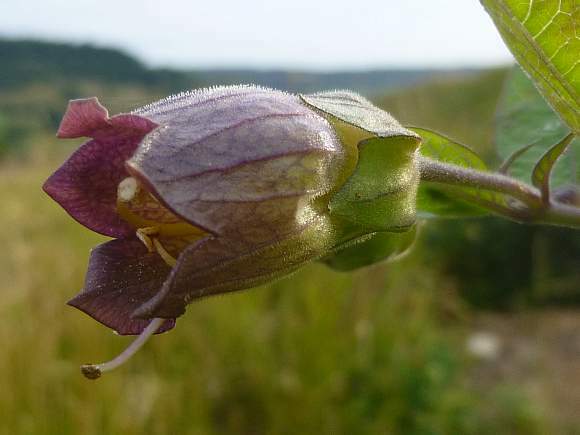 Obvious dark purple coloured veins on the flowers like Henbane. 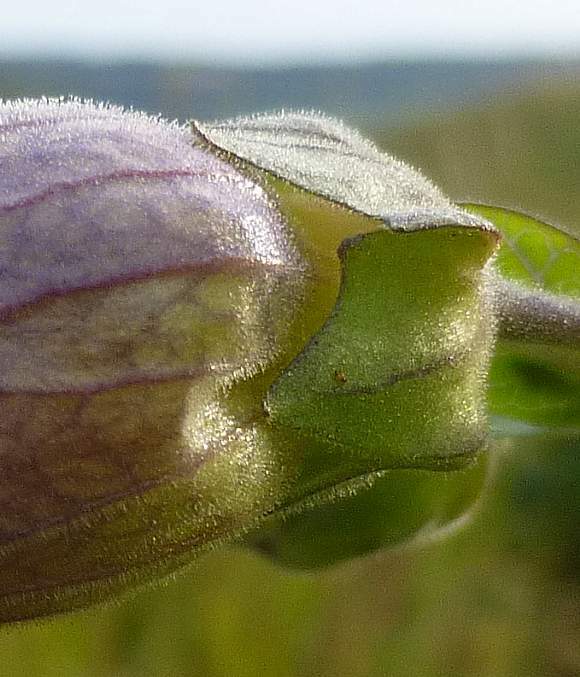 Stems, leaves and flowers are slightly hairy. The petals start of green, reddening from the tips. 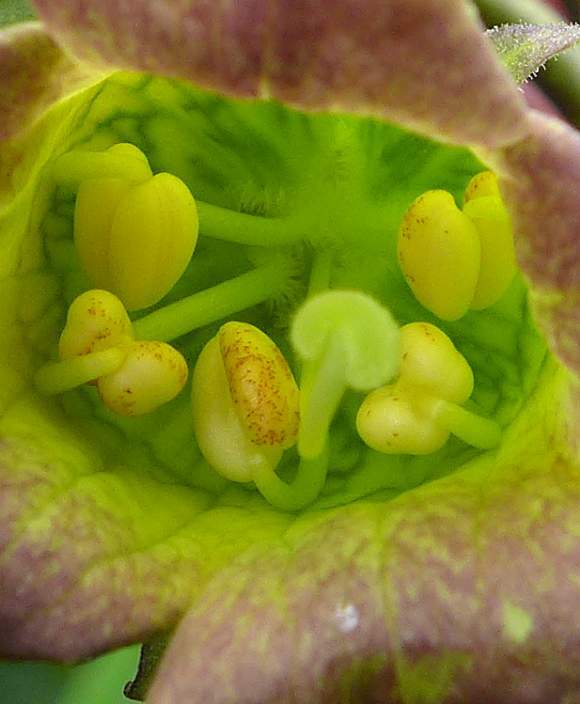 Five sepals loosely cup each flower. 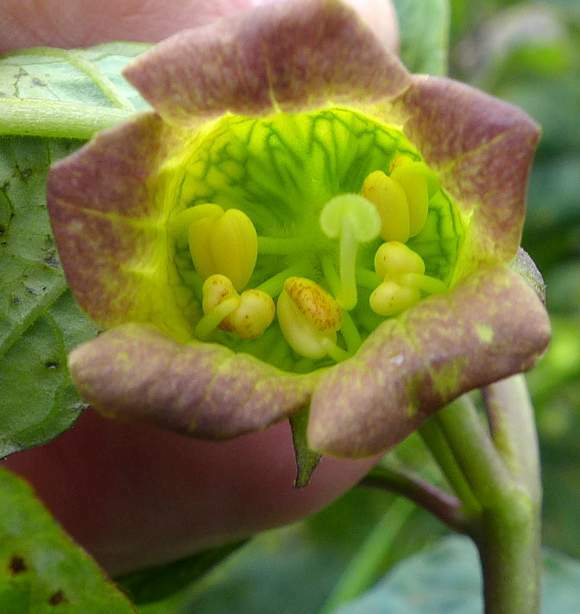 The flower corolla is 24-30mm long and bell-shaped, cut at the end into 5 short triangular lobes (or 'petals'). The corolla has prominent veins, it looks like three per 'petal'. The dirty-purplish flowers grow singly in the axils of the leaves on short stalks little longer than the flower corolla. Open wide now, this won't hurt. Say 'aaah'. 5 filaments with large doubled anthers looking like tonsils or some other part of the male human anatomy much lower down. One style emergest from the centre of the filamens bearing a discoidal stigma. Note the veins in the petals at the bottom. The sepal cups are flared like the Tuba, a brass musical instrument. Berry turning from green to black. The berries eventually turn black when ripe. The plant is covered in a dense short and sticky stubble of glandular hairs of very uniform length as if it has just had a close shave with an inefficient electric razor. The veins by transmitted light. 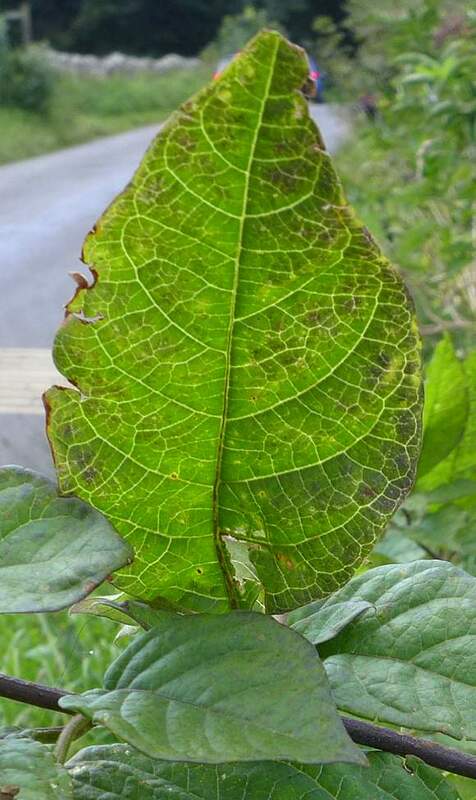 The main veins try to avoid the leaf edges by looping around. 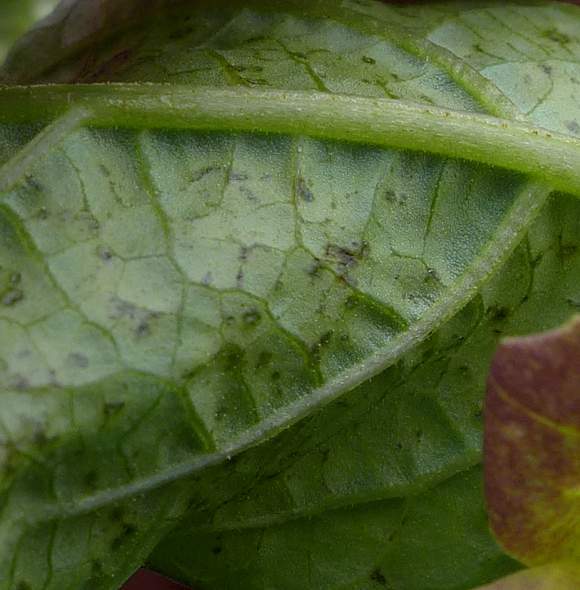 Ridged veins on underside of leaf. Some similarities to : Henbane, a member of the same family, but that has larger flowers where the petals are rounded rather than pointed. Distinguishing Feature : The large black berries or the green to dark-purple bell-shaped flowers. No relation to : Alpine Enchanter's Nightshade (Ciracea alpina) or Enchanter's Nightshade (Ciracea lutetiana), Upland Enchanter's Nightshade (Ciracea × intermedia), [plants with similar names belonging to a differing family]. 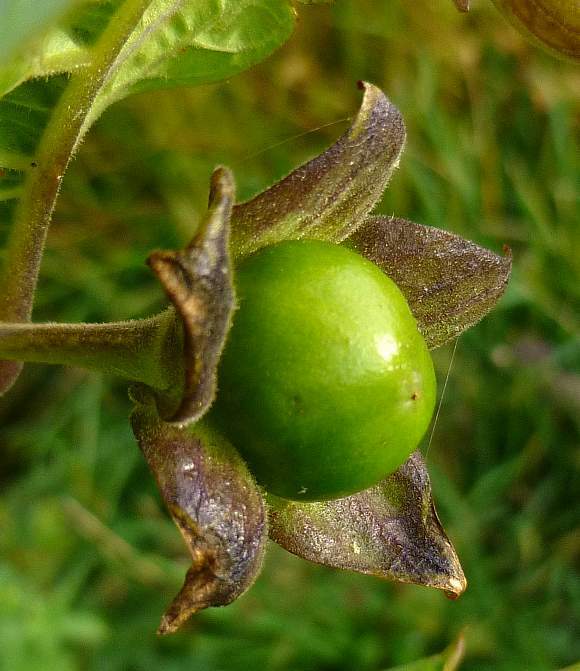 The only plant in its genus, Atropa, but other Nightshades are related: Leafy-fruited Nightshade (Solanum saracoides), Small Nightshade (Solanum physalifolium), Green Nightshade (Solanum physalifolium var. 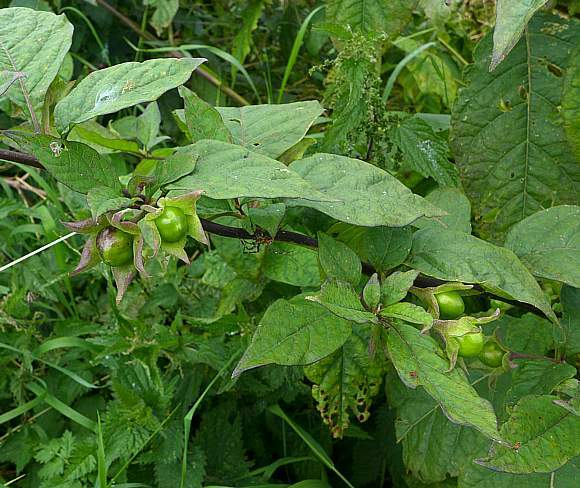 nitidbaccatum) Woody Nightshade (Solanum dulcamara), and Black Nightshade (Solanum nigrum) and all are poisonous to some degree but not as much as Deadly Nightshade. It grows in old quarries, on scrub and waste ground but always on lime. The very poisonous berries are green at first turning black, large and presented singly still within the five green sepals in which the flowers used to snuggle. Ingestion of 10 to 20 berries is sufficient to kill an adult, but a quarter of that for a child and where just 2 berries can cause symptoms to appear. Consumption of just 0.3gram of the leaves (corresponding to a single leaf) is toxic. All parts of the plant contain dangerous quantities of Tropane alkaloids, but the roots contain most. Hyoscyamine (aka daturine) is the main toxin and is the laevorotatory stereoisomer to Atropine which is the dextrorotatory counterpart. Scopolamine, another tropane alkaloid, is a minor component. These alkaloids, if ingested, cause dilation of the pupil of the eye. Since women look more attractive with wider pupils, this plant was often used cosmetically by women up until the Renaissance period to dilate their eyes, hence the plant became known as 'belladonna', a name which has subsequently been subsumed into its scientific name. 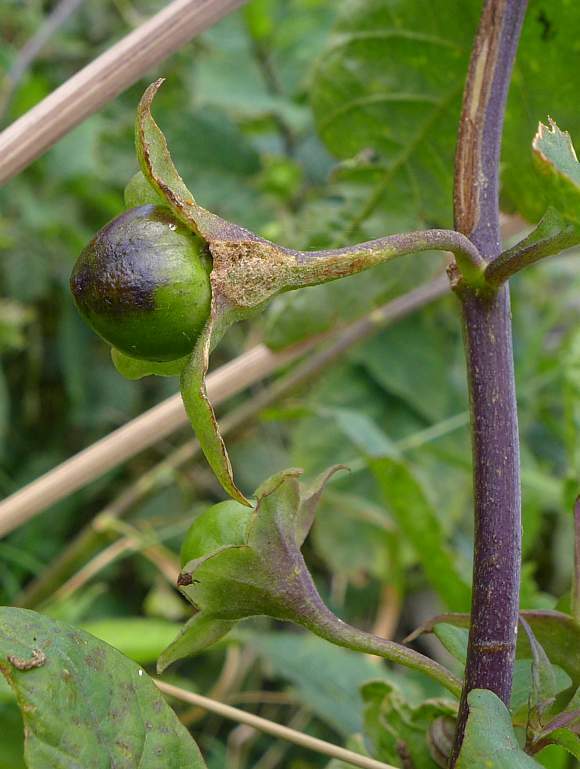 The first part of its name, Atropa, gives rise to the name of the alkaloid found within it, Atropine. 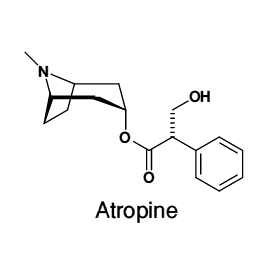 laevo-atropine has been used in medicine as a mydriatic to dilate the pupils for eye examinations, etc. Scopolamine has been used in pills for travel sickness and to alleviate the analgesic effects of opioid analgesics. The two are antidotes for each other. Rabbits and cattle are seemingly immune to the toxins able to eat it without noticable ill effects. The amount of toxins within the plant is subject to vary quite a lot. 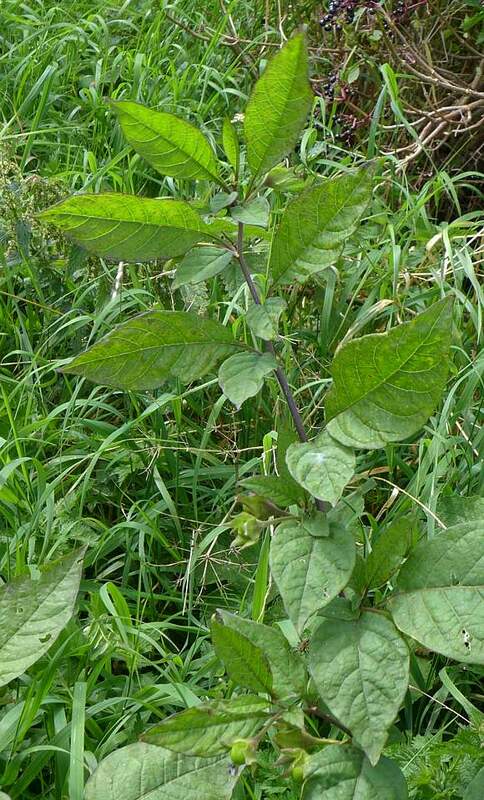 The plant has been used as an arrow poison. A feeling of being able to fly and other hallucinogenic experiences was experienced by rubbing the leaves on the skin, especially on sensitive areas of the skin where it is thinner. Thus began the depiction of witches on brooms flying across the landscape. 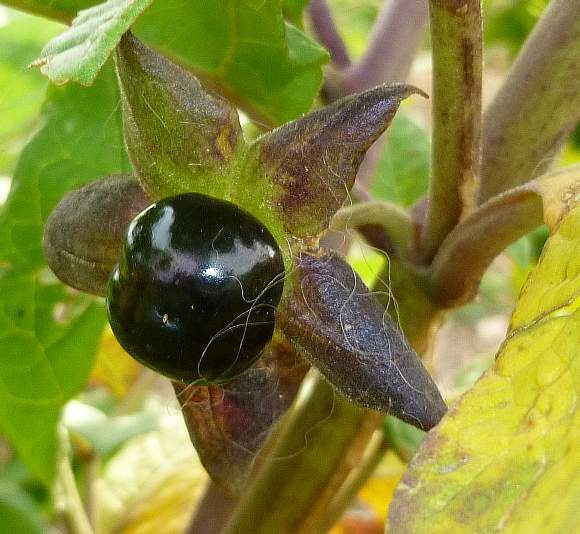 Deadly Nightshade, together with several other Solanaceae species such as Thorn-Apple, also contains the poisonous Pyrrolidine alkaloids Hygrine and its dimer called CuscoHygrine . Hygrine is found mainly in the coca plant from which Cocaine, another toxic pyrrolidine alkaloid, is obtained. Hygrine is a thick yellow liquid with a strong taste and strong disagreeable smell. CuscoHygrine is an oil which is water-soluble and was first found in Cusco leaves (aka Coca leaves) in 1889. These two compounds are commonly found in only the more toxic members of the Solanaceae family. 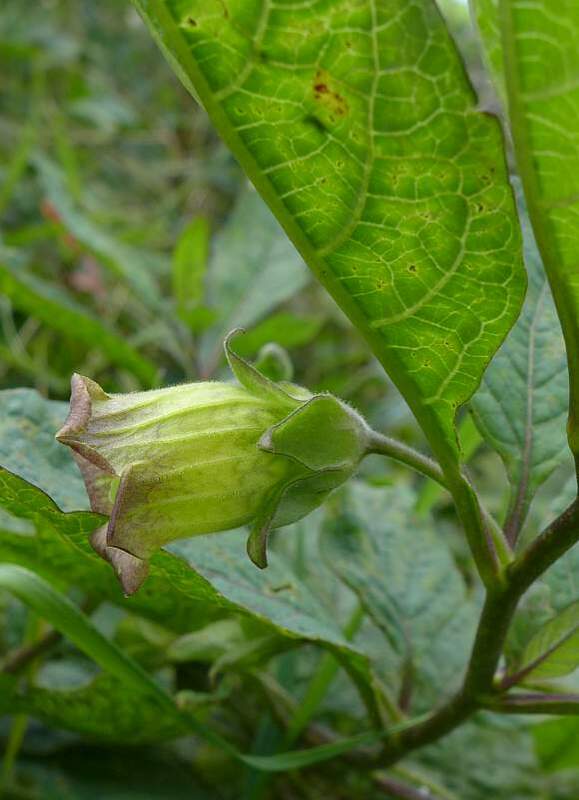 Belladonnine is found in the acuminata variety of Deadly Nightshade (Atropa belladonna var. acuminata) which does not seem to occur naturally in the UK. Belladonnine, although not a dimer, has two units of the Tropane moiety (the moiety with the nitrogen atom on the left). It has most similarities to Atropane which is also found within the Deadly Nightshades. Both are toxic principles. 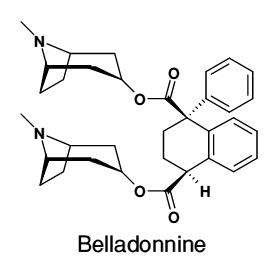 Belladonnine can be synthesized from Atropine by warming with Hydrochloric Acid, HCl.